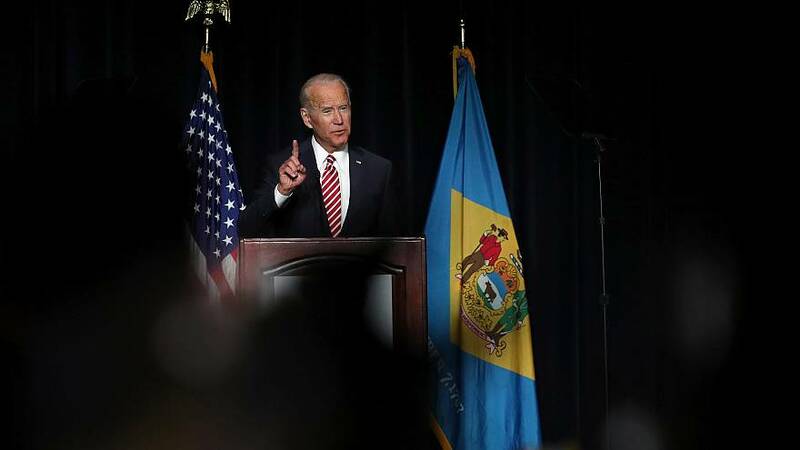 WASHINGTON — Leading in the early polls before he's even announced his 2020 candidacy, Joe Biden has a problem on his hands. Beto O'Rourke held rallies in three Texas cities in one day (El Paso, Houston and Austin), setting the early campaign pace for the 2020 field. Bernie Sanders appeared to be on pace to raise more than $20 million for the first quarter, revealing the power of grassroots online donations in today's politics. And Rep. Alexandria Ocasio-Cortez, 29, took aim at the Democratic Congressional Campaign Committee's effort to blacklist vendors who work with candidates challenging incumbents, underscoring the progressive-versus-establishment split inside the party. Biden's greatest strength is the fact that he's been in the political mainstream of the Democratic Party for the last 40 years, as one of us said on "Meet the Press" yesterday. But there's another scenario, too: His past becomes THE story for the 2020 campaign, making it difficult for other candidates to break through, a la Trump in '16. Of course, there's a big difference between Biden and Trump: One can be shamed; the other one can't. The headline from our latest NBC News/Wall Street Journal poll is that the American public doesn't see a clear verdict about whether President Trump has been cleared of wrongdoing in the Russia probe. Twenty-nine percent of adults say they believe Trump has been cleared of wrongdoing, based on what they've heard about Robert Mueller's findings. That's compared with 40 percent who say they don't believe he has been cleared. And a third of Americans — 31 percent — say they're not sure if Trump has been cleared. Bottom line: Despite all the coverage of Attorney General William Barr's SUMMARY of Mueller's findings, the American public still hasn't made up its mind. This combined with the renewed health-care push is a reminder that President Trump's biggest political vulnerability is being turned into a conventional conservative whose policy ideas just aren't popular. One of us traveled to El Paso over the weekend to cover the first leg of Beto O'Rourke's three-city swing through Texas on Saturday. And he made unity his other big theme ("Let's agree, going forward, before we are anything else, we are Americans first"). That's the combined share of Democratic primary voters who say they're either enthusiastic (33 percent) or comfortable (40 percent) with Joe Biden as a presidential candidate. For Bernie Sanders, it's a combined 62 percent enthusiastic or comfortable. For Elizabeth Warren, it's 57 percent. For Kamala Harris, 52 percent. And for Beto O'Rourke, 48 percent. It's worth noting that both Harris and O'Rourke could have some significant room to grow. Nearly one-in-five Democratic primary voters say they don't know enough about those candidates to make a call yet. Don't miss the pod from Friday, which laid out our biggest questions about how 2020 candidates are faring in their first quarter of fundraising. Trump has threatened to close the border. Adviser Kellyanne Conway says that "certainly isn't a bluff." NBC's own Steve Kornacki looks at the last midsize city mayor to try to run for president. Seth Moulton says he'll decide on a 2020 in run "in the next few weeks." Elizabeth Warren's finance director is out as her campaign struggles to raise cash. Here's what our NBC/WSJ poll found about public views of the Mueller findings so far. Here's why New York's attorney general should make Trump nervous. Here's how Mitch McConnell is shutting down Nancy Pelosi's agenda. Is Trump facing a "red-line moment" with Putin in Venezuela? Here's NBC's wrap of the Lucy Flores accusations and Biden's response. Here's what John Hickenlooper had to say about the Biden charge. The AP looks at how Kamala Harris's calls for criminal justice reform are surprising observers of her early career.